Happy January 10th friends! Today is the day I join some friends for Ten on the 10th to share ideas for life that cost less than $10. We decided to have a Valentine's theme today because we are thinking ahead a little bit. That's rare for me so when Lisa of The Purple Hydrangea suggested it, I jumped on board! I cued up my phone with a Podcast and started to paint these nicely sized beads in the carefully selected color that suddenly started to look like Pepto Bismol....and I realized that my beads were not beads but they were instead knobs! A knob has a hole on only one side, y'all! I put my jacket back on and was about to exit the house for another quick trip to Hobby Lobby when my sweet husband brought out the drill and suggested drilling the knobs. You can see the model up above drilling the knobs while wearing rubber gloves. The rubber gloves prevent slippage. I considered using photo magic to remove the wrinkles from the model's neck but that looked more like plastic surgery gone wrong! This project really could not be any easier and in fact, it reminded me of the projects we did when I taught 4 year old babies! In my wisdom, I attempted to string the beads on crocheted ribbon which proceeded to disintegrate. I then strung them on white yarn and tied the pretty crocheted ribbon on the ends so that it magically looks like it's part of the garland but it's really not. The metal heart was something I've had around the house for years and I don't remember where it came from. I knew it would have a great use sooner or later. So there you have it! My nod to Valentine's Day with my very own handmade $6.00 bead garland. ♥♥♥ Is it just me or does this color remind you of Dusty Rose circa 1980 something? 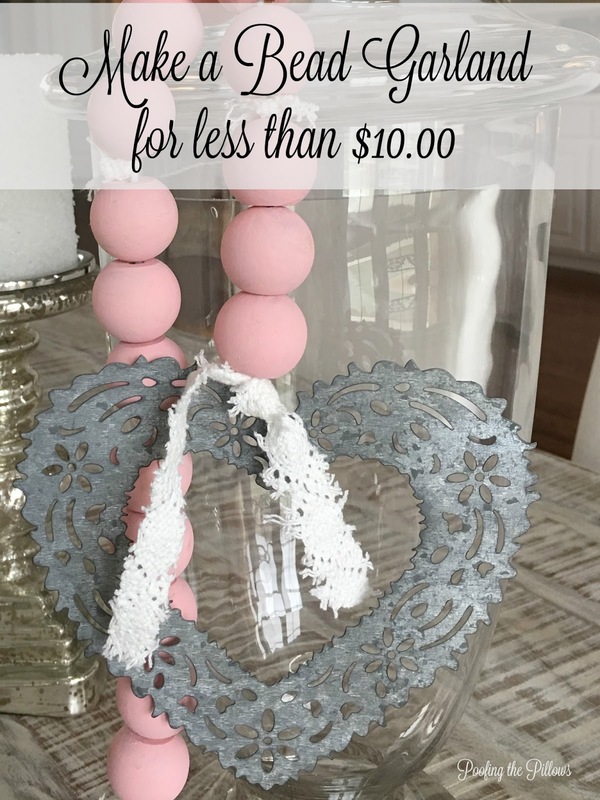 Be sure to pop over to my much more crafty and smart friends to see what they have to share for less than $10. I am laughing hysterically! You crack me up!!! First of all I have loved the beads for a long time too, but like you, didn't want to pay that much for a sting of beads. What a wonderful idea. I will definitely be trying this!!! 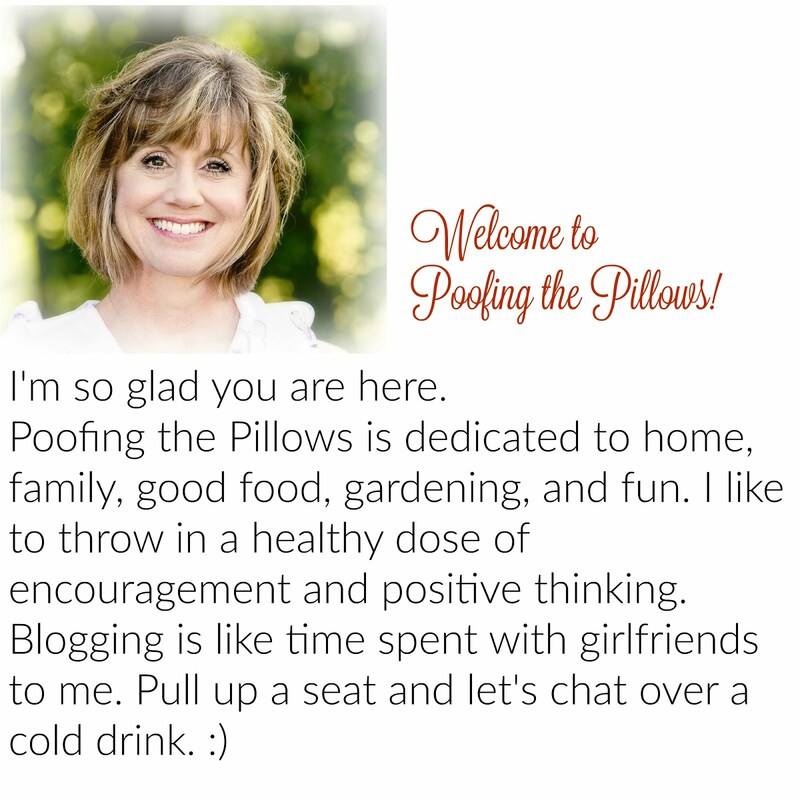 Second, you don't know how many times I've almost hit the wrinkle fix button on PicMonkey! lol. Reminds me of My Big Fat Greek Wedding: "Grab my neck!". If you didn't see it, all the older women yell this to their friends to grab the back of their necks and pull the wrinkles out just before they have their picture taken. Awesome job! Your persistence paid off! The need to drill would have been a deal breaker for me. The garland turned out great and the heart is definitely the frosting on the cake. You made me spit out my coffee!!! That is a wonderful bead garland, and I think you ARE a crafter. I didn't include links on my being bold suggestions because they were all over $10. Ok, so I love, love, love the beads. They are gorgeous, but your narration is the best. I did laugh all the way through and boy did I need that. Thank you my friend and Happy Valentine's Day!! You are a hoot! The bead garland turned out great despite the slight one hole dilemma! I think you've crossed over into the crafty girls' arena! I am transported to the early 80’s but I gotta admit, I like the pink beads a lot! Your wit makes me grin! Happy day beautiful! Ummm. That is too funny. I have the same knobs/doll heads in my craft closet. I did exactly the same thing but have yet to drill the holes and string them together. I agree, those beaded garlands are really expensive. I too, was looking for a cheaper way. This is an adorable post. I love that metal heart! I love your pearls of Pepto Bismol! LOL, I would never have known they were knobs. I too have been coveting these trendy beads I see everywhere. Ok, you had me laughing out loud this morning! Your garland did turn out cute! Totally cracking up! I love that you kept it real. I stop at drill. The garland looks great, though! Four stars on creativity and perseverence! Stacey I am so glad to hear that your husband came to the rescue. The end result is lovely and even if there were a few glitches along the way, it only helps to make us better as crafters. Your perseverance paid off big time. This is very cute. I would like to make one, and I love the pink paint color! Stacey, I love your “keepin’ It real transparency and you humor. I love all the beads too and I’ll tell you when I glanced at these I thought they were the felted wool and wondered where you’d found them. Great idea making the wood version. I’ve looked at the felting wool online a toyed with making my own. I have caved and bought a couple of strands, but would love some pastels. Great job!!!! OMW Stacey, you had me grinning from ear to ear. 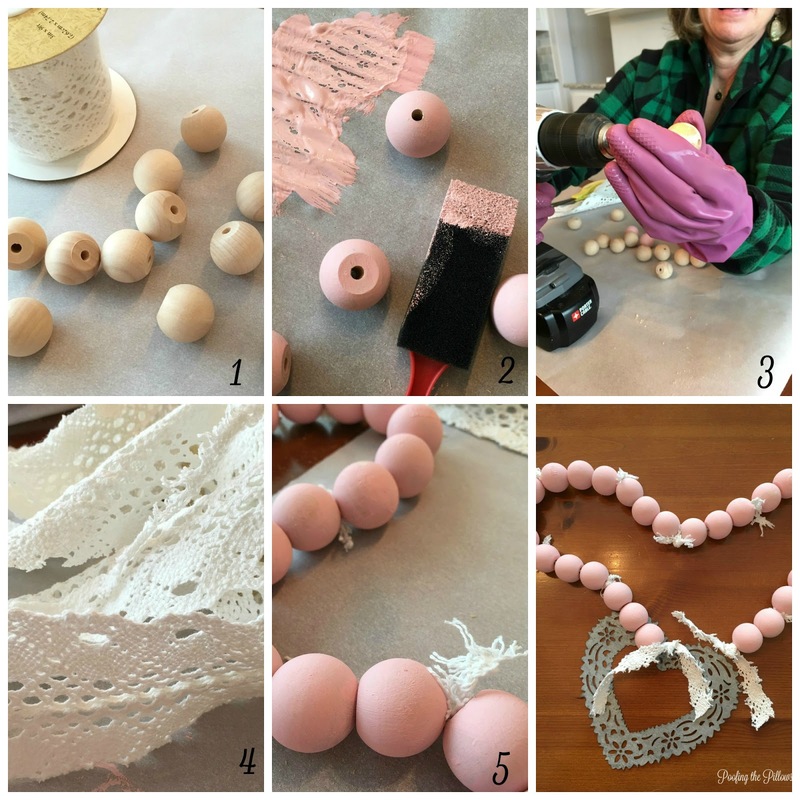 I love the way you explain things and your knobby bead garland looks awesome. You can’t deny your crafting savvyness! Your post is too cute as week as the beads! Cute string of beads! You did not do that project on your new kitchen counter, did you?! You are too funny with the comment on the model. I love you. Too funny Stacey. You crack me up. That dusty rose color was the color of the bridesmaids dresses in my wedding in 1981 lol! So cute, so crafty, so fun and so cheap! The perfect idea! Love them! I'm going to have to jump on board as well. Thanks for the inspiration! I think you did a great job! And you ARE funny! :) Loved reading this! I got such a laugh out of this! Something the dog dragged up... lol. I love the finished project and especially the price! I loved your "love beads" post. You are a hoot! I can totally relate to your crafting issues. I often dream up a project and then find that I have no ability whatsoever to create said project. Nowadays, I try to look at crafting as therapy. It's fun and if it looks like a preschool project, I either hide it or tell people my niece made it. I love your pink beads! It makes me want to paint a wooden bead garland I made last year, but of course mine will be red,. Well you certainly turned lemons into lemonade by solving your problem with that handy drill...now for me, I am not sure if my hubby would trust me with the drill...He says I am allergic to power tools! Love the way the beaded garland turned out!....Love the pink..perfect for Valentine's and I think Pepto Bismol is pretty! The heart is truly the perfect touch!! I applaud you on using that drill. I'm thinking of taking a class at Home Depot. The bead garland is so stunning cute. I'd love to do something for the 4th of July. Maybe a wee one!!! It's very pretty! Great idea! Ha! this is much better than what my dog dragged up!!! too, funny!! Your bead garland looks great, nice job!! Hehe you made me laugh, Stacey! And I'm so glad you didn't give up and gave the drill a go! 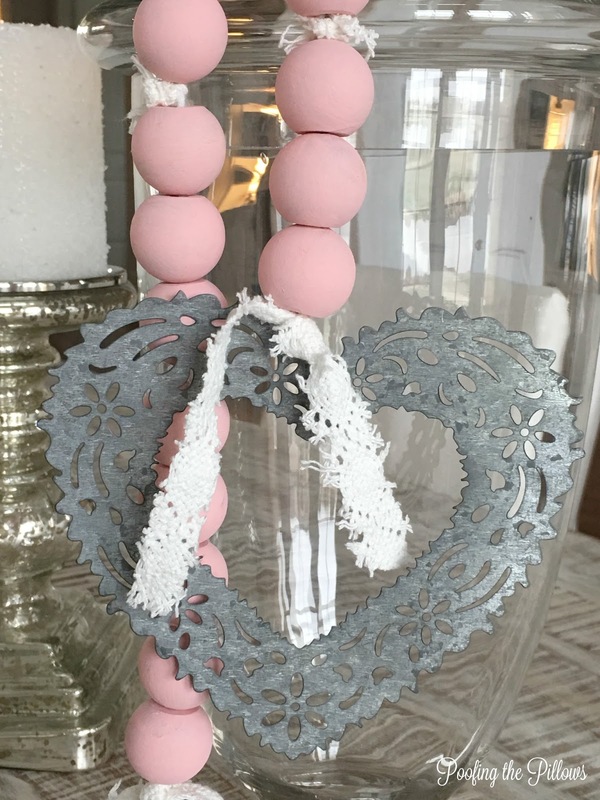 Love your beaded garland and the soft pink is perfect! Well, you made me laugh girl! I think it's darling. I bought some red beads at our local thrift and thought that I would sting them for something fun for Valentines. Too cute, I laughed my way through the post. I hate power tools so I probably would have gone back to the store. The bead garland turned out great, which makes you a crafter, not a wanna be!